We offer two asset tracking solutions, depending whether or not you require integration with our asset management suite. 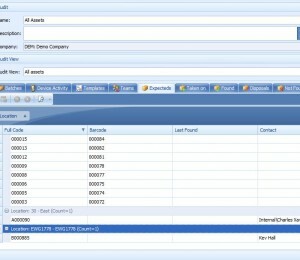 Assetware Tracker is integrated with and utilizes the AssetWare Manager asset database. ASSETTRACKER® is a stand alone solution that maintains it’s own asset database and does not require any of our other products to function. Both products enable clients to add, track and dispose of assets. The desktop application is the control centre where information is retrieved from the source data and then sent to the handheld barcode or RFID scanners. The handheld units allow for asset additions, movements, transfers, disposals and goods received to be recorded quickly and easily. In addition to all of this functionality, our asset tracking solutions enable you to complete a full physical asset audit of the asset register displaying progress with the desktop application. The simple and intuitive user interface provides an up to date summary of the position of work as well as the updates to the source asset register. Asset Capture – Using a series of asset templates to complete the core asset information, assets are quickly and easily added to the asset records. Asset moves – Using asset identifiers, barcode or RFID tags, record asset movements keeping your fixed asset register locations and cost centres up to date. Full physical asset audits -Complete full company asset verifications, complete individual areas or asset types over a period of time, verifying the basis of asset locations, cost centres and asset information. Asset disposals – Quickly record items as disposed as they leave the building automating information for the financial asset managers. GPS asset positioning – Record the last known GPRS position of the asset. Barcode, RFID and asset tag compatible – Use various forms of asset tags and several data fields to identify assets or simply search for the asset description. Identify duplicate records – A number of processes utilised over time can result in the same asset being recorded more than once. Alternatively in some instances the same barcode number can be used on more than one asset. Assetware Tracker provides enough information to resolve these queries. Data search – Looking for assets that are not clearly identified or their tag has been damaged is aided by the search facility. 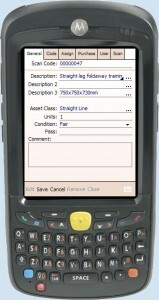 Full asset details – A breadth of asset information is available to the user on the handheld device. The information can be updated as standard transactions are completed. Project overview – The simplicity of the main application shows clearly how an audit is progressing detailing founds, not founds, expected and disposed assets. Device management – Detailed overview of what scanners are in use, how many have been returned and what data was collected is detailed in the Devices section. Team Results – Experience has proven that the best results are obtained when people work together as a team of 2. To help with the management of these teams and to ensure that accuracy and speed is maintained a team progress can be reviewed through the reporting features. Scan code parameters – To ensure that the correct barcodes are detected the required expected barcode format can be specified. This is just a snapshot of what our asset tracking solutions can accomplish for you. If you would like to discuss our asset tracking software in more detail or require a demonstration then please do contact us on +44(0)870 112 0700 or email sales@assetware.co.uk.